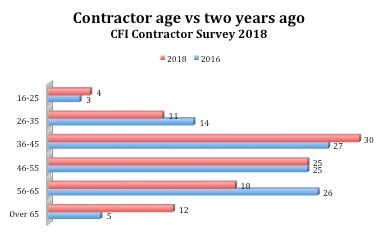 Oct. 24, 2018 – It’s common knowledge that the average age in the logging industry is going up, and CFI’s 2018 Contractor Survey results back up the growing concern for the next generation of loggers. The estimated average age of contractors across Canada is 49 years old. Quebec has the lowest average contractor age of just 40, while Alberta is in the middle at 46. 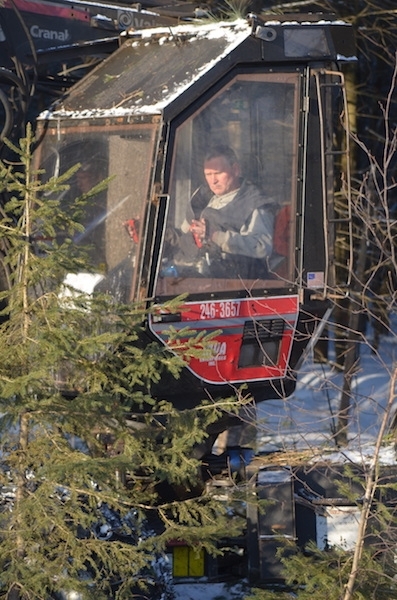 In both provinces 60 per cent of contractors fall between the ages of 36 and 55. Even more encouraging for those regions is that at least a quarter of contractors there are under 35. 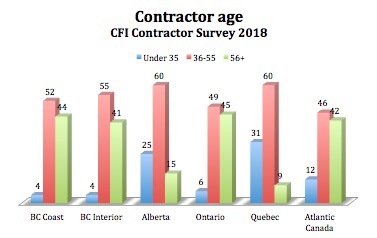 When asked how long they expect to be in the industry, a healthy 42 per cent of Alberta contractors and 39 per cent of Quebec contractors say it will be 16 or more years. Percentage of contractors who are in these age brackets, by region. The industry outlook is mixed when we compare these numbers to our 2016 survey results. The total percentage of contractors under 55 remains relatively unchanged over the two years, with small fluctuations among the under-55 categories. The biggest change in age demographics was a drop in the number of contractors between 56 and 65 years old, and a spike in those over 65. See how the numbers compare in the graph below. Percentage of contractors in these age ranges. This demographic change may help explain why there was an increase in the percentage of contractors expecting to leave the industry in five years or less, which in 2016 was 28 per cent, and in 2018 is 36 per cent. That means more than a third of contractors in Canada are looking to get out of the business in fewer than five years, which, regardless of their succession plans, will mean a radically different logger landscape within the coming years.